Your company deserves a logo that is researched, well-designed, and meaningful. Our process ensures that we get it right and that your logo is uniquely you. We will lead you through a diligent discovery and planning process, then provide several thoughtful options to choose from. The end result will be distinctive, memorable, and right for your business’s personality. One other advantage of working closely with a design professional? We’ll give you all the file formats you’ll need for future projects, including EPS, JPG, and PNG, in full color and 1 color. You won’t ever be scrambling for a file when someone asks for your logo. 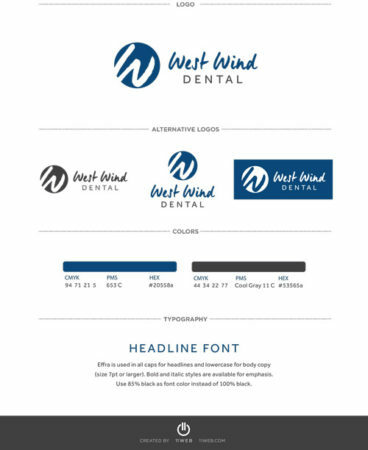 Visual Identity Guide that we created for West Wind Dental. This guide defines their primary and alternative logos, brand colors, and fonts. From there, we can extend your logo into a full visual brand identity. That means defining the colors, fonts, textures, graphics, and image treatments that you can use consistently whenever you represent your brand. We’ll even deliver it in a gorgeous Visual Brand Guide for easy reference. Logo design is available as part of a full digital marketing package. We are excited to start designing logo concepts for you. To get started, just fill out our contact form.